NASA's Kepler Space Telescope has discovered more than 2,300 exoplanets since its 2009 launch. Now, with the help of machine learning technology from Google, the space agency says it has spotted an eighth planet orbiting a distant star. Dubbed Kepler-90i, the newfound planet is a super-hot, rocky world orbiting Kepler-90, a sun-like star located 2,545 light-years from Earth. The discovery means that the Kepler-90 system is now tied with our own solar system for the greatest number of planets around a single star. "Just as we expected, there are exciting discoveries lurking in our archived Kepler data, waiting for the right tool or technology to unearth them," Paul Hertz, astrophysics division director at NASA headquarters in Washington, D.C., said in a written statement. "This finding shows that our data will be a treasure trove available to innovative researchers for years to come." Machine learning enabled NASA computers to "learn" to examine Kepler data to spot telltale signs of exoplanets — tiny dips in a star's brightness caused by a planet passing in front it. 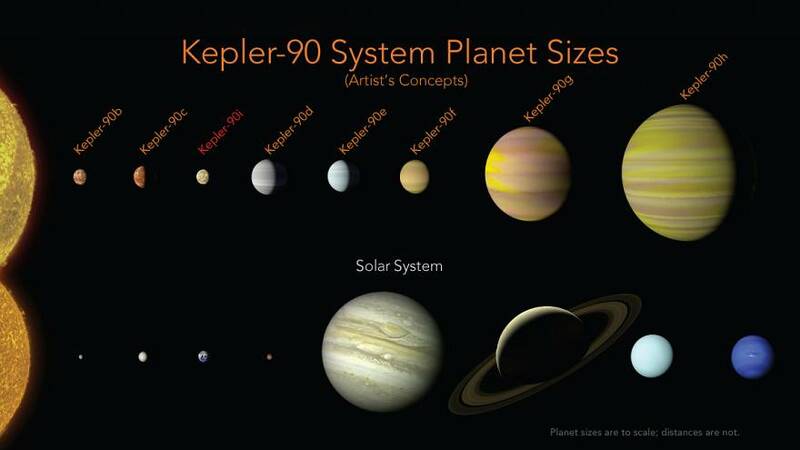 The AI technology makes it possible to find some of the weakest signals from distant exoplanets, as it did with the previously missed Kepler-90i, according to the researchers. "It's like sifting through rocks to find jewels," Andrew Vanderburg, a University of Texas astronomer, said in the statement. "If you have a finer sieve then you will catch more rocks but you might catch more jewels, as well." Sara Seager, a planetary scientist at MIT, said it was "exciting" to see machine learning applied to exoplanets. "For Kepler data in general, the method might be used to find even more exciting systems such as an actual Earth-sized planet in an Earthlike orbit about a sunlike star," she told NBC News MACH in an email. Might the Kepler-90 system host life? NASA said It's not likely. Kepler-90i's orbit takes it so close to its host star that its surface temperature is believed to exceed 800 degrees Fahrenheit (427 degrees Celsius). That's similar to conditions on Mercury, which, of course, is considered uninhabitable. A research paper describing these findings has been accepted for publication in an upcoming issue of The Astronomical Journal.